Concise European Copyright Law aims to offer the reader a rapid understanding of all the provisions of copyright law in force in Europe that have been enacted at the European and international levels. 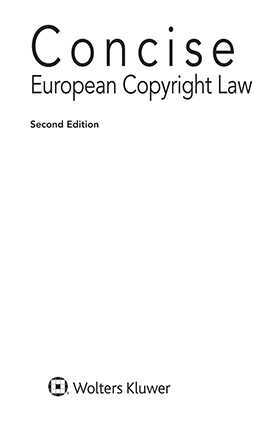 This volume takes the form of an article-by-article commentary on the relevant European directives and international treaties in the field of copyright and neighbouring rights. It is intended to provide the reader with a short and straightforward explanation of the principles of law to be drawn from each provision. Editors and authors are prominent specialists (academics and practitioners) in the field of international and European copyright law. Concise European Copyright Law is part of ‘Concise IP’, a series of five volumes of commentary on European intellectual property legislation. The five volumes cover: Patents and related matters, Trademarks and designs, Copyrights and neighbouring rights, IT and a general volume including jurisdictional issues. International Conventions in the Field of Copyright and Neighbouring Rights. Berne Convention for the Protection of Literary and Artistic Works (Berne Convention) (Dreier). WIPO Copyright Treaty (WCT) (Senftleben). International Convention for the Protection of Performers, Producers of Phonograms and Broadcasting Organizations (Rome Convention) (Brison). Convention for the Protection of Producers of Phonograms Against Unauthorized Duplication of Their Phonograms (Geneva Convention) (Brison). WIPO Performances and Phonograms Treaty (WPPT) (Brison). Agreement on Trade-Related Aspects of Intellectual Property Rights (TRIPS) (arts. 9–14). (Dreier/Hugenholtz). Directive 2009/24/EC – on the legal protection of computer programs (Computer Programs Directive) (Bently/Yin-Harn). Directive 2006/115/EC – on rental right and lending right and on certain rights related to copyright in the field of intellectual property (Rental and Lending Right Directive) (Krikke). Directive 93/83/EC – on the coordination of certain rules concerning copyright and related rights to copyright applicable to satellite broadcasting and cable retransmission (Satellite and Cable Directive) (Hugenholtz). Directive 2006/116/EC – on the term of protection of copyright and certain related rights (Term Directive), as amended by Directive 2011/77/EU (Term Extension Directive) (Angelopoulos). Directive 96/9/EC – on the legal protection of databases (Database Directive) (Hugenholtz). Directive 2001/84/EC – on the resale right for the benefit of the author of an original work of art (Resale Right Directive) (Vanhees). Directive 2012/28/EU – on certain permitted uses of orphan works (Orphan Works Directive) (Guibault). Directive 2014/26/EU – on collective management of copyright and related rights and multi-territorial licensing of rights in musical works for online use in the internal market (Collective Rights Management Directive) (van Gompel).